The work holds promise for eco-friendly disposable personal electronics and biomedical devices that dissolve within the body. There are also defense applications, including devices that can be programmed to dissolve in order to safeguard sensitive information, said Cunjiang Yu, Bill D. Cook Assistant Professor of mechanical engineering at the University of Houston and lead author of the paper, published in Science Advances. The field, known as physically transient electronics, currently requires immersion in aqueous corrosive solutions or biofluids. Yu said this work demonstrates a completely new working mechanism – the dissolution is triggered by ambient moisture. "More importantly, the transient period of time can be precisely controlled," he said. That means a biomedical implant could be programmed to disappear when its task – delivering medication, for example – is complete. Sensitive communications could be devised to literally vanish once the message was delivered. And all those old cell phones littering kitchen drawers? New versions could be programmed to dissolve when they are no longer needed. "We demonstrate that polymeric substrates with novel degradation kinetics and associated transience chemistry offer a feasible strategy to construct physically transient electronics," the researchers wrote. "Through the manipulation of the polymer component and environmental humidity, the progress of hydrolyzing polyanhydrides can be managed and thus the dissolution kinetics of (a) functional device can be controlled." The time period can range from days to weeks, or even longer, they said. The model constructed by the researchers works like this: Functional electronic components were built via additive processes onto a film made of the polymer polyanhydride. The device remained stable until ambient moisture triggered a chemical breakdown that digested the inorganic electronic materials and components. The researchers tested a number of compounds, including aluminum, copper, nickel indium-gallium, zinc oxide and magnesium oxide, and developed various electronic devices, including resistors, capacitors, antennas, transistors, diodes, photo sensors and more, to demonstrate the model's versatility. The lifespan of the devices can be controlled by varying the humidity level or by changing the polymer composition, Yu said. 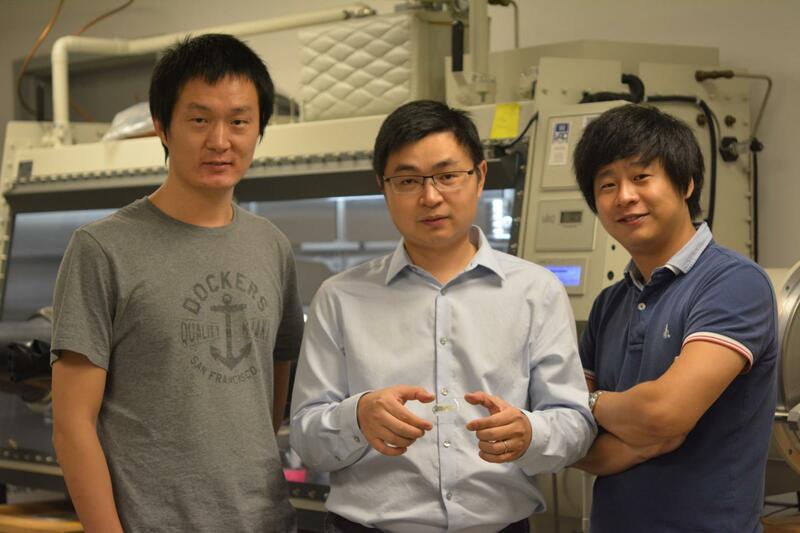 In addition to Yu, authors on the paper include Yang Gao, Xu Wang, Kyoseung Sim, Jingshen Liu and Ji Chen, all from UH, and Ying Zhang and Hangxun Xu of the University of Science and Technology of China.